It’s ALIIIVE! Er, wait, no. It’s here! 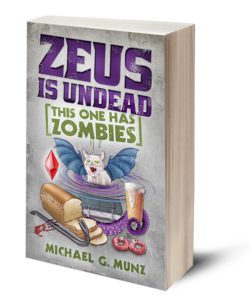 My latest comedic fantasy, Zeus Is Undead: This One Has Zombies is published and available today! It’s taken me far longer than I would have liked to get this book out there, but I’m pleased it’s finally ready for you. It’s definitely something I can be proud of. 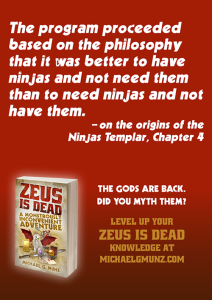 But just in case any of you are new here, perhaps I ought to answer the question of just what, exactly, is Zeus Is Undead? I’m glad you asked, hypothetical person! 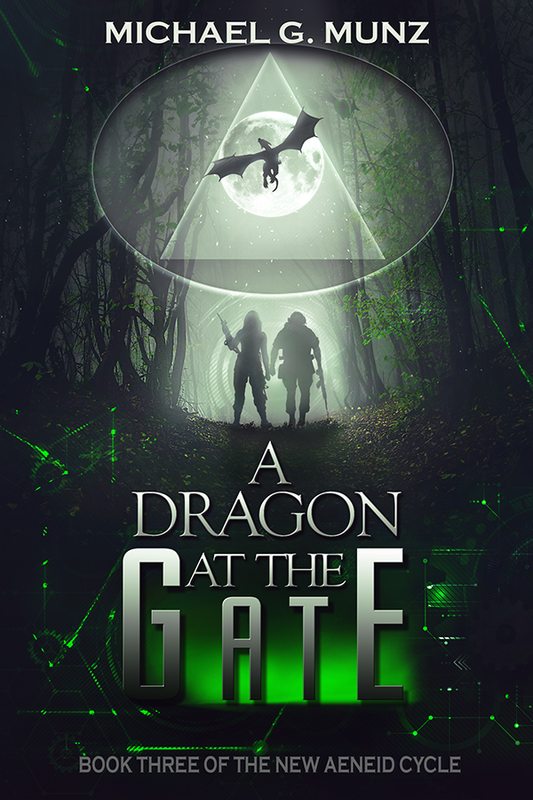 A Dragon at the Gate available for pre-order! Plus a 99 cent sale! 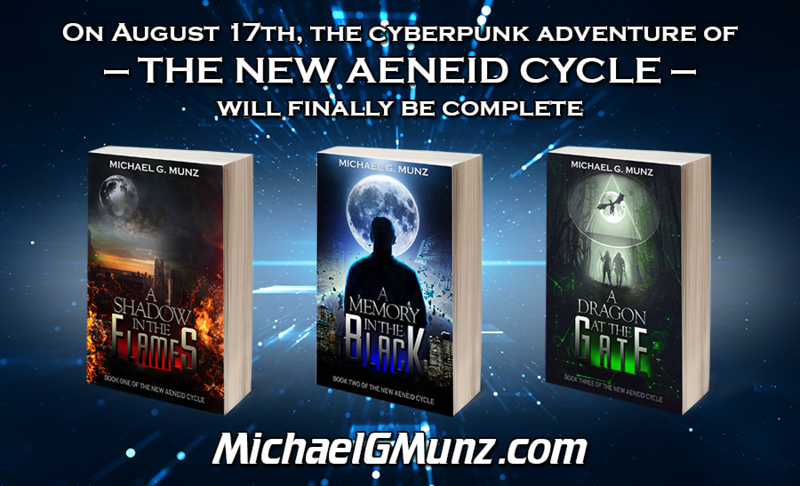 As the August 17th release day hurtles toward us for A Dragon at the Gate, the final book in my cyberpunk adventure series The New Aeneid Cycle, I’m excited to announce that you can now pre-order the book! 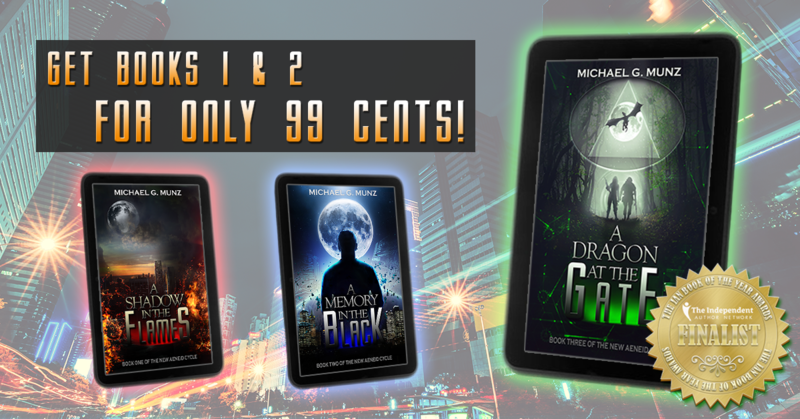 What’s more, right now you can also get books 1 and 2 in the series for just 99 cents each! 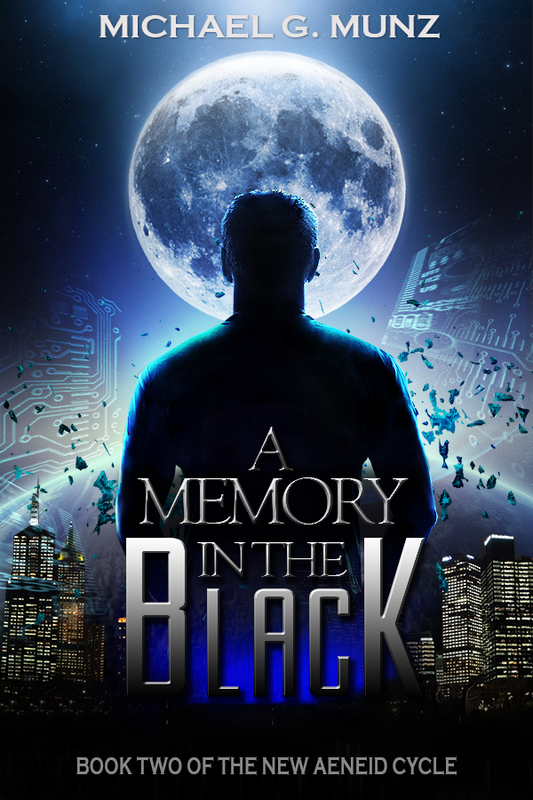 99 cents for a limited time! 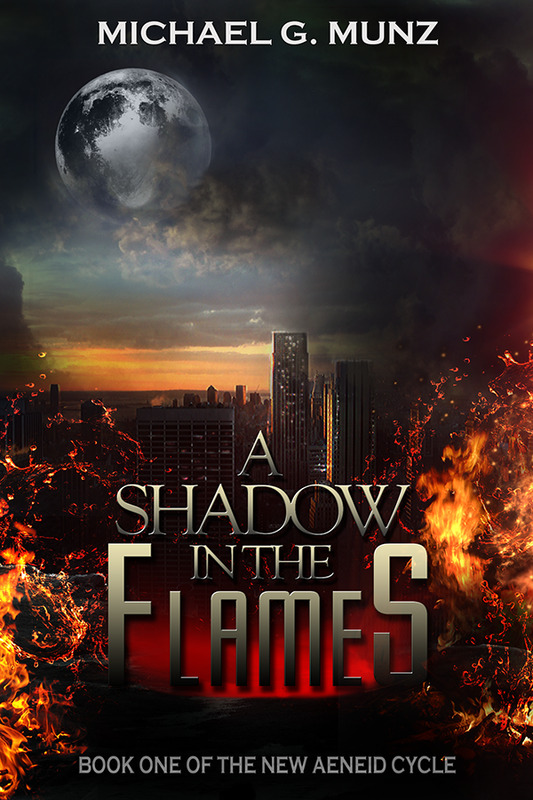 At the moment, the pre-order and sales are only available on the Kindle versions. 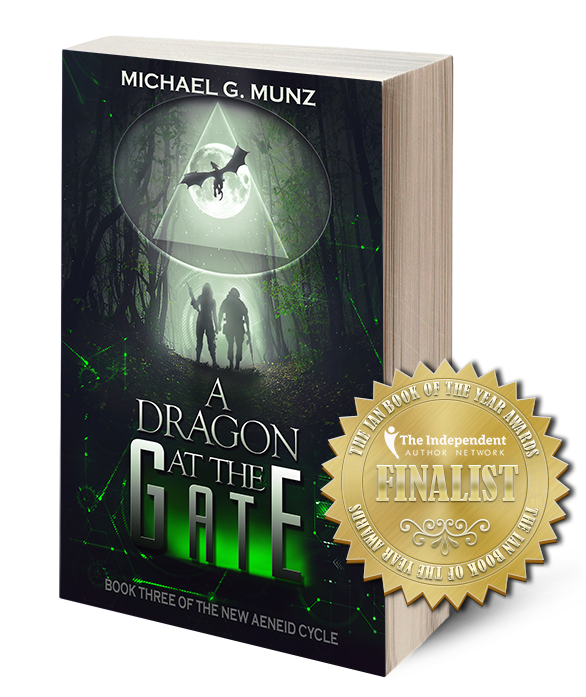 A paperback version of A Dragon at the Gate will also be available starting on August 17th. I can’t wait for everyone to read it! I really feel the series just gets better with each successive book. Hi everyone! This being Wednesday, you’d normally be seeing a new Guest Geek post up here today. Unfortunately my geek-wrangling has temporarily failed me this week, but there will be more very soon. 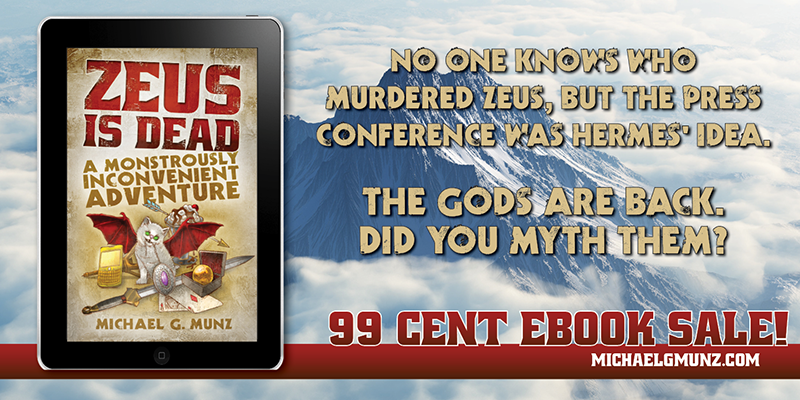 In the meantime, this gives me the perfect opportunity to let you know that Zeus Is Dead: A Monstrously Inconvenient Adventure is just 99 cents this week in all ebook formats! That’s over 80% off of the regular ebook price! That’s over 55 BILLION TIMES LESS EXPENSIVE than a stealth fighter! THE GODS ARE BACK. DID YOU MYTH THEM? You probably saw the press conference. Nine months ago, Zeus’s murder catapulted the Greek gods back into our world. Now they revel in their new temples, casinos, and media empires–well, all except Apollo. A compulsive overachiever with a bursting portfolio of godly duties, the amount of email alone that he receives from rapacious mortals turns each of his days into a living hell. Soon an overflowing inbox will be the least of Apollo’s troubles. Whoever murdered Zeus will certainly kill again to prevent his return, and avoiding them would be far easier if Apollo could possibly figure out who they are. Even worse, the muse is starting to get cranky. 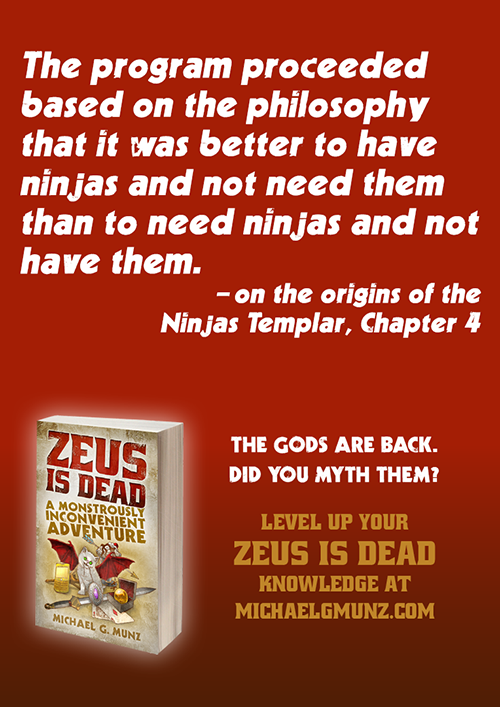 Discover a world where reality TV heroes slay actual monsters and the gods have their own Twitter feeds: Zeus Is Dead: A Monstrously Inconvenient Adventure! So why not pick up a copy, or gift a copy to a friend or even a random stranger as an April Fool’s Day prank? This promotion is scheduled to end Friday, April 3rd, so grab it while it’s still insultingly cheap!